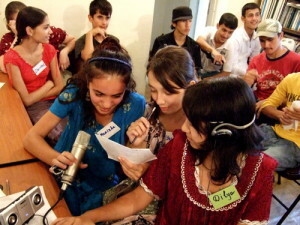 On July 4th, 2007, in Dushanbe, I met with a group of young English learners and we spent two hours together. First we did a listening activity based on a a short song that I wrote the night before. Then I told them they were going to write their own songs. The students wrote their own lyrics, and set them to music, which they also wrote. Then they recorded their songs – both music and vocal tracks – on my laptop computer. They based their music on audio loops – short snippets of music – that they cut and pasted together. None of these students had ever recorded before, but during a single lesson they created their songs from scratch. So, believe it or not, students CAN create entire songs within the span of a single lesson!